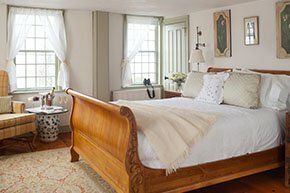 A quintessential bed & breakfast with a water view and within walking distance of the shops in historic Newport, Rhode Island. THINK SAILING! The Captain Simeon Potter House, lodging in the center of Newport RI, is a great base for a vacation or a business trip. It's also the perfect venue for reunions, parties, corporate events, and spending time with family and friends. Our Newport RI bed and breakfast is available for shared or exclusive use. This lovingly restored 18th-century sea captains home on the bay blends the rich history of the house with modern amenities, including heated towel bars, marble bathrooms, individual heat/AC, TV's, WIFI and phone ports. After a sumptuous breakfast of fruit-filled crepes, one can sink into a book in the most comfortable of period furnishings in the sun-drenched library. Unhurried; understated; we cater to the worldly visitor. With meticulous attention to detail, we'll also craft your personal itinerary for touring the bay and experiencing all the Things To Do in Newport RI. Browse through the wonderfully charming little shops in the historic Brick Market in Washington Square. Explore the cobblestone side streets and meander Bowen's and Bannister's Wharves. With pedestrian-friendly streets and outdoor restaurants, allow yourself to experience the charm of this old seaport. Newport has the highest concentration of Colonial Homes in the nation. 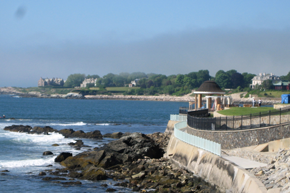 The "Point," the oldest section of Newport is a National Historic Landmark District. In addition to the beautiful views of the water, the Point neighborhood is known for the many private gardens that are opened to the public during the annual Secret Garden Tour. The Simeon Potter House is a proud recipient of the 2005 Newport Historical Preservation Award! "My husband and I stayed at this wonderful B&B for a beautiful fall weekend in Newport. We were blown away by Joanna's hospitality...over and over she went above and beyond for us (and she is a great cook!). The house is a gem, with three hundred years of history under its eaves. The location can't be beat--it's right near the water, a stone's throw from the downtown area and all the shops and restaurants. It's also right across from the shipyard where you can gape at the making of billionaire's yachts. I can't imagine staying anywhere else when we return to Newport." 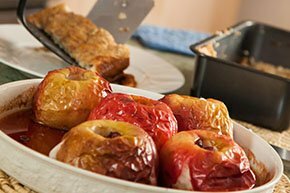 Visit Newport.... Newport abounds with history and food that give rise to the satisfying senses of curiosity and fine dining. Take a history walking tour that takes you through neighborhoods and streets that most tourists never see, finish it of with a delightful, dining experience on the wharf. And finally on your return along the harbor to the Captain Simeon Potter House, for that relaxing nap, take that last photo of the emblematic Newport Bridge. Plan your getaway weekend; Be doted on at the Captain Simeon Potter House, we believe we can cater to your wishes on your weekend get-away with a standard that will exceed your expectations. Cliff Walk: “WALK the WALK” Breathe in the warm sunshine walk that legendary Cliff Walk; revere the ocean and cherish the moment. Whether this adventure is a power walk or you are setting the dream scene wrap yourself in the moment. Ocean Drive: “PEDAL THE DRIVE” plan that romantic bike ride on Ocean Drive weaving in and out of romantic beach hideaways. We'll pack a special picnic lunch for the basket and you'll flirt with the drive...THINK PEDAL POWER.